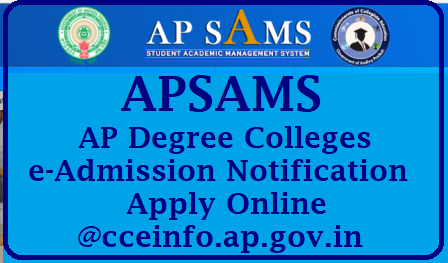 The objectives of APSAMS are; – Ensure single window system for admission through e-Admission process. Make admissions for student / parents / guardians economical. Reduce the workload of the Colleges using online admissions. Then go the Higher Education Department website www.cceinfo.ap.gov.in, and click on the Online Application Form in its home page. The applicant will pay Rs 177/- per application in Meeseva. The Challan can be downloaded in the last step of the application process or an e-mail attachment.